The structural style and deformation history needs to be determined to be able to assess the hydrocarbon potential of the Salt Range-Potwar Plateau, Kohat Plateau and Bannu Basin. To determine the deformation history, first the differences in the rocks types and deformation styles need to be evaluated. We propose to collect the field data needed to determine the deformation history, then model the deformation history. Once we have used two dimensional and three dimensional models, we will be able to assess the hydrocarbon migration into the reservoirs and the traps in the petroleum system. Sponsor/Funds:Pakistan Science Foundation (PSF) and National Science Foundation of China (NSFC)/ 56 millions PKR. Sponsor/Funds:Planning and Development Department, Government of Khyber Pakhtunkhwa, Pakistan/ 8.4 millions PKR. Sponsor/Funds:University of Twente the Netherlands and the NCEG / 2 millions PKR. Geochemical control of potential toxic elements (PTEs), associated risk exposure and source apportionment of agricultural soil in Southern Chitral, Pakistan. Microchemical Journal. Geochemical profile and source identification of surface and groundwater pollution of District Chitral, Northern Pakistan. Microchemical Journal, volume 145, pp 1058-1065. Precise Seismic Sub-structural Model of Eocene Chorgali Limestone in Turkwal Field, Central Potwar, Pakistan . Hydrochemical properties of drinking water and their sources apportionment of pollution in Bajaur Agency, Pakistan. 2019. Sedimentological and geochemical analysis of the middle Jurassic Shinwari Formation, Upper Indus Basin, Pakistan: Implications for palaeoenvironmental and hydrocarbon assessment. Assessment of Cambrian Sequence Stratigraphic style of the North China Platform exposed in Wuhai division, Inner Mongolia. Sedimentation and glaciations during the Pleistocene: Palaeoclimate reconstruction in the Peshawar Basin, Pakistan". Calcified cyanobacteria fossils from the leiolitic bioherm in the Furongian Changshan Formation, Datong (North China Platform). Carbonates and Evaporites. Iqbal, S. Bibi, Mehwish. Wagreich, M. Jan, I. U. Kuerschner, W. M. Gier, S.
Hot-house climate during the Triassic/Jurassic transition: The evidence of climate change from the southern hemisphere (Salt Range, Pakistan). Global and Planetary Change (Impact Factor= 3.98/2017). Sequence-stratigraphic position of oolitic bank of Cambrian in North China platform: example from the Kelan section of Shanxi Province. Arab J Sci Eng. "Landslide inventory and susceptibility modelling using geospatial tools, in Hunza-Nagar valley, northern Pakistan." Fluoride prevalence in groundwater around a fluorite mining area in the flood plain of the River Swat, Pakistan”. Science of the Total Environment 2018, 635, 203-215. Ahmad. S. Jan. I. U. et al., (2018/in press). Stratigraphic and paleoclimatic reconstruction of the Upper Carboniferous-Lower Permian strata from the Southern Gondwanaland remnants in Pakistan. Stratigraphy. Khan, H., M. Shafique and M. A. Khan (in press). "Landslide susceptibility assessment using Frequency Ratio, a case study of northern Pakistan." The Egyptian Journal of Remote Sensing and Space Sciences. "A data-driven approach to landslide susceptibility mapping in mountainous terrain: a case study from the NW Himalayas, Pakistan." Natural Hazards Review. Shafique, M., F. Babar, B. Alam Sher and U. Saleem (In press). "Evaluating glacier dynamics using temporal remote sensing images; a case study of Hunza valley, northern Pakistan." Environmental Earth Sciences. Özcan, E., Saraswati, P. K., Yucel, A.O., Ali, N. Hanif, M. 2018. Bartonian orthophragminids from the Fulra Limestone (Kutch, W India) and coeval units in Sulaiman Range, Pakistan: a synthesis of shallow benthic zone (SBZ) 17 for the Indian Subcontinent. Geodinamica Acta 30 (1). Geological Control of High Fluoride Concentrations in Drinking Water and its Health Impacts: A Case Study From the District Swabi, Khyber Pakhtunkhwa Pakistan. Accepted Medical Geology EGU General Assembly Vienna Austria. Enrichment, spatial distribution of potential ecological and human health risk assessment via toxic metals in soil and surface water ingestion in the vicinity of Sewakht mines, district Chitral, Northern Pakistan. Ecotoxicology and Environmental Safety. Relating petrophysical parameters to petrographic interpretations in carbonates of the Chorgali Formation, Potwar Plateau, Pakistan. Carbonates and Evaporites, doi: 10.1007/s13146-017-0414-x. 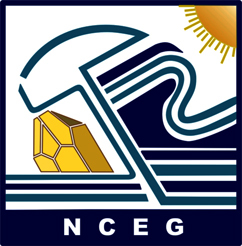 ATC-2018 Best Presenter Prize Awarded to the MS Geology Scholars of NCE in Geology.